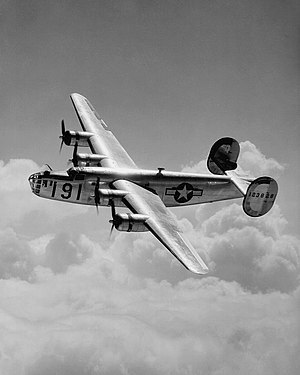 At its inception, the B-24 was a modern design featuring a highly efficient shoulder-mounted, high aspect ratio Davis wing. 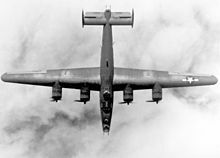 The wing gave the Liberator a high cruise speed, long range and the ability to carry a heavy bomb load. 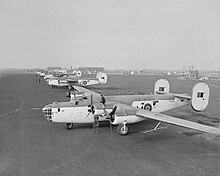 Early RAF Liberators were the first aircraft to cross the Atlantic Ocean as a matter of routine. 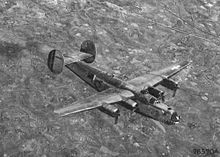 In comparison with its contemporaries the B-24 was relatively difficult to fly and had poor low speed performance; it also had a lower ceiling and was less robust than the Boeing B-17 Flying Fortress. 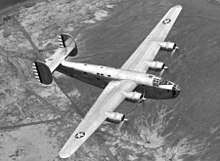 While aircrews tended to prefer the B-17, General Staff favored the B-24, and procured it in huge numbers for a wide variety of roles. 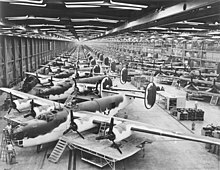 At approximately 18,500 units – including over 4,600 manufactured by Ford Motor Company – it holds records as the world's most produced bomber, heavy bomber, multi-engine aircraft, and American military aircraft in history. 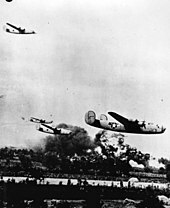 The first B-24 loss over German territory occurred on 26 February 1943. 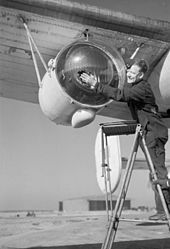 Earlier in the war, both the Luftwaffe and the Royal Air Force had abandoned daylight bombing raids because neither could sustain the losses suffered. The Americans persisted, however, at great cost in men and aircraft. In the period between 7 November 1942 and 8 March 1943, the 44th Bomb Group lost 13 of its original 27 B-24s. For some time, newspapers had been requesting permission for a reporter to go on one of the missions. Robert B. Post and five other reporters of The New York Times were granted permission. 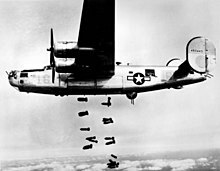 Post was the only reporter assigned to a B-24-equipped group, the 44th Bomb Group. 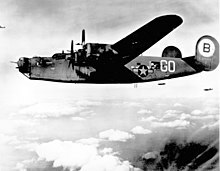 He flew in B-24 41-23777 ("Maisey") on Mission No. 37 to Bremen, Germany. Intercepted just short of the target, the B-24 came under attack from JG 1's Messerschmitt Bf 109s. Leutnant Heinz Knoke (who finished the war with 31 kills) shot down the Liberator. Post and all but two of the 11 men aboard were killed. 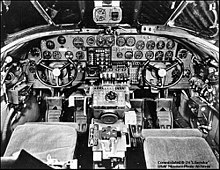 Knoke reported: "The fire spread out along the right wing. The inboard propeller windmilled to a stop. And then, suddenly, the whole wing broke off. At an altitude of 900 metres there was a tremendous explosion. The bomber had disintegrated. The blazing wreckage landed just outside Bad Zwischenahn airfield," which would later be used for some of the first Messerschmitt Me 163B Komet rocket fighter operations. This page was last edited on 16 April 2019, at 11:09 (UTC).